Conan Doyle also wrote three Sherlock Holmes parodies himself. The Mystery of the Spot Ball appeared in 1893, The Field Bazaar in 1896 - both were published in the magazine of the Edinburgh University, called The Student. The third parody, entitled How Watson Learned the Trick, appeared in 1924 in The Book Of The Queen's Dolls' House. The creator of Sherlock Holmes, Sir Arthur Conan Doyle once spent his summer holiday in France. The writer, who was world famous at that time, tried to travel incognito, but he could hardly wait to be recognized. When he was travelling home, he got into a hansom cab and bonneted. - Where shall I take you, Sir Arthur Conan Doyle? – asked the coachman. - Have we met before, that is why you know my name? – asked the perplexed writer. - No, sir, we have never met before. But I read in the papers that you spent your holiday in Marseilles, and people arriving from that place usually take a cab here. Your tanned skin suggests that you travel home from vacation. By your clothes it is clear that you are British, not French. Putting together these facts I came to the conclusion that you are none but Sir Arthur Conan Doyle. - That’s incredible! You have the same logic as my character Sherlock Holmes! – said Doyle with enthusiasm. - Tush! It’s an aggravation. – answered the coachman humbly. - It helped a lot that your name is on one of your suitcases. 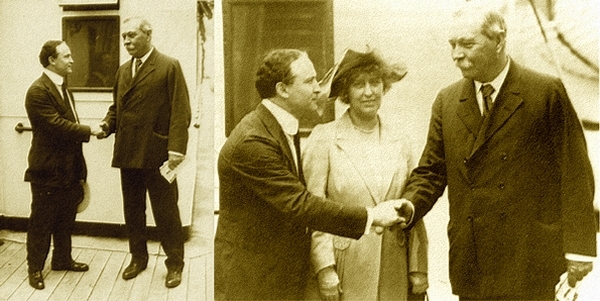 The world famous illusionist, Harry Houdini was the friend of Doyle for some time past. Their friendship had been spoiled by the fact that the writer solidly believed in fairies, future-tellers and spookists, while Houdini knew exactly that there is jugglery behind all of them. In order to unveil the tricksters, he revealed some tweaks for the creator of Sherlock Holmes. For example, when he visited Doyle, he shook hands with Sir Arthur while he wore an artificial finger and it remained in Doyle’s hand. But the crackdown had the reverse effect – it verified the writer’s faith. After the incident he began to stress that Houdini had been able to perform his escaping tricks because he transcended the physical limits. So Harry Houdini became a spiritual being.
" 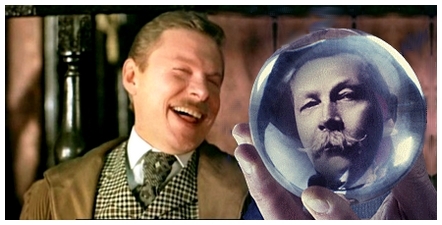 Sir Arthur Conan Doyle hoax, humour, jokes "